New Komodo™ CAN Solo Interface - Now Available! Calling all CAN developers and users! 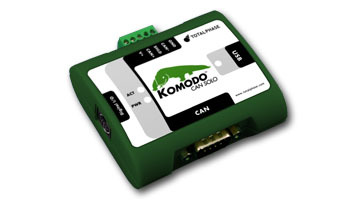 Check out Total Phase's newest product – the Komodo™ CAN Solo Interface! Our engineers have taken the same rich set of state-of-the-art features available in the Komodo CAN Duo Interface (2012 Best in Test finalist), and packaged them into the new, lower cost Komodo CAN Solo Interface. The Komodo CAN Solo Interface is a powerful single channel USB-to-CAN adapter and analyzer. This highly efficient development tool is capable of actively transmitting CAN data and passively monitoring the CAN bus. As always, Total Phase includes all the software required to take advantage of this world-class tool in the low initial price. To actively transmit CAN data,the Komodo CAN Solo Interface utilizes our powerful Komodo GUI Software, while the award-winning Data Center Software enables you to non-intrusively monitor all CAN bus traffic. Additionally, we provide a royalty-free API for advanced users to create their own custom applications in C, C++, C#, Python, VB6, and VB.Net. Two powerful pieces of software, the robust royalty-free API, and one versatile USB-to-CAN adapter for just $350. For more information about the Komodo CAN Solo Interface, please visit our website. If you have any questions, feel free to contact our business team at sales@totalphase.com or at (408) 850-6501. 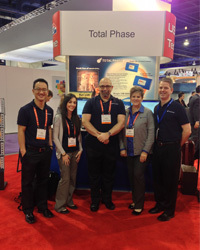 Earlier this month, the Total Phase team headed off to Las Vegas to exhibit at the Consumer Electronics Show. As part of the USB TechZone, we exhibited our suite of award-winning USB protocol analyzers, including the Beagle™ USB 5000 v2 SuperSpeed Protocol Analyzer. Attendees also had the chance to see our latest prototype for power measurement in USB 2.0. Consumers demand devices that perform better than ever and use less power than before. Using our latest technology, our engineers have made it easier to correlate power consumption to device activity on the USB bus with this power measurement feature. Do you have feedback or suggestions on what additional features you'd like to see on our next USB product? Email us at sales@totalphase.com or call (408) 850-6501. 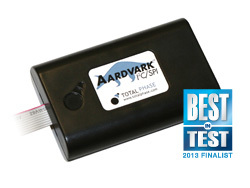 Aardvark™ I2C/SPI Host Adapter Named as a Test of Time Finalist! We are both honored and excited that the Aardvark™I2C/SPI Host Adapter has been named as a finalist for the Test of Time Award. Presented by Test & Measurement World, the Best in Test Awards recognize the very best in test products and test professionals. The annual Test of Time Award is presented to a product that continues to provide state-of-the-art service more than five years after its introduction. Since its release in 2003, the Aardvark adapter proved to stand the test of time with its efficient and cost-effective I2C/SPI capabilities. The Aardvark adapter's enduring popularity with engineers has defined this product as a classic and reliable embedded systems tool. Packed with numerous features, including the ability to send and receive data as an I2C/SPI master or slave, the Aardvark adapter has been used across many industries in various testing, production, and development environments. The winner will be announced during the Best in Test 2013 Awards Ceremony on January 31, 2013 in conjunction with DesignCON 2013. I'm very pleased with my Beagle USB 5000 v2 SuperSpeed Protocol Analyzer. My work flow has smoothed out significantly. I also love that I have the Beagle analyzer connected to the same USB host as the test device.